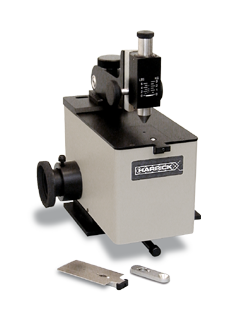 Harrick’s SplitPea™ is a horizontal ATR accessory with the smallest sampling area of any ATR accessory – less than 250 µm in diameter for its Si ATR crystal. The SplitPea™ is configured to apply localized, measured pressure to produce superior contact between the sample and the ATR crystal. 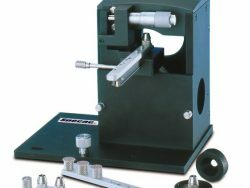 This makes the it ideal for quick and easy spectroscopy measurements for a wide range of samples. These include: hard samples, like paint chips and combinatorial chemistry substrates; small samples, such as individual fibers and nanoliters of liquids; large samples, such as transparency film and defects thereon. 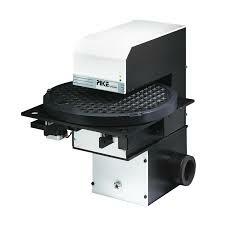 For positioning samples on the sampling area, a 50X viewing microscope is available. In addition to making ATR nanosampling simple and straightforward, the SplitPea™ features PermaPurge™ for rapid sample and crystal exchange without interrupting the purge of the spectrometer. The Harrick SplitPea™ HATR accessory is an innovative alternative to infrared microscopes, beam condensers, and diamond cells. ATR and specular reflection capabilities provide application versatility. High sample throughput due to little or no sample preparation. 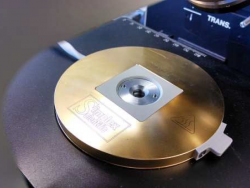 Small sampling area – less than 250 µm in diameter for ATR with a silicon crystal. Minimizes stray light due to the small sampling area. Inert ATR crystals available for use from the NIR to the Far-IR. Calibrated pressure applicator for reproducible ATR measurements. Designed for optimal contact between the ATR crystal and hard surface solids. Flip-up, streamlined pressure applicator for easy access to sampling area. High energy throughput with DTGS detectors. 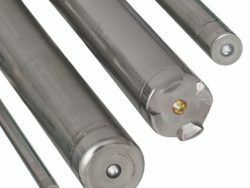 Harrick’s exclusive PermaPurge™ allows rapid sample and ATR crystal exchange without interrupting the purge of the FT-IR system. Upgrade to a 50X ViewThruPress™ for easier viewing of the sampling area. Options include Flow-Through Liquid Cell and Heatable Sampling Plates for operation to 200°C. Two ATR holders with mounted Si hemispheres or one ATR holder with a mounted diamond ATR hemisphere. Powder Retainer for studying powders by ATR. Specular reflection sample holder and alignment mirror. Mating hardware for the specified FT-IR spectrometer.